MCCLAIN (52) — M.Stegbauer 0 (0) 0-2 0, C.Bolender 1 (1) 0-0 5, B.Weller 1 (0) 0-0 2, J.Pitzer 0 (1) 0-1 3, M.Adams 1 (1) 0-0 5, K.Uhrig 2 (1) 2-4 9, K.Burchett 3 (1) 2-2 11, B.Karnes 4 (0) 4-4 12, L.Kegley 1 (0) 6-6 8. TOTALS: 13 (5) 14-19 55. HILLSBORO (42) — M.Cosby 4 (0) 2-2 10, G.Dean 3 (0) 1-2 7, K.Watson 2 (1) 1-2 8, K.Burns 3 (0) 0-3 6, L.Grover 1 (1) 1-2 6, K.Hopkins 1 (1) 0-0 5. TOTALS: 14 (3) 5-11 42. GREENFIELD — Though the McClain Lady Tigers and Hillsboro Lady Indians are rivals on the court in Highland County, there was also a great deal of sportsmanship on display Saturday afternoon between the visitors and the home team. Earlier this season, McClain standout senior Maddy Stegbauer — who was averaging 12.6 points per game this season — suffered a torn ACL in the fifth game of the season during the third quarter in a McClain win against Huntington. That day saw the entire basketball season change for the Lady Tigers, and for Stegbauer, she saw her senior season come to a close. On the opening tip — before the Lady Tigers defeated the Lady Indians, 55-42 — McClain got the opportunity to celebrate Stegbauer, as she was not only in the starting lineup with her fellow seniors one last time, but teammate Bryn Karnes knocked the opening tip-off to her. The entire gym stood to give Stegbauer an ovation, as the senior went to her sister and teammate Emma Stegbauer, along with head coach Jarrod Haines, on the sideline with tears in her eyes. The standing ovation continued as Stegbauer exited the game, but it wasn’t her final exit. Late in the fourth quarter, Stegbauer — with the assistance of HHS head coach JR Moberly (who held onto the basketball and asked for a technical) — was able to take two free throw shots in the gym where she helped lead the Lady Tigers to numerous victories. Again, the crowd stood and cheered on Stegbauer for the final time at McClain Gym. "To be honest with you, we wanted to do something for her. It’s just unfortunate what happened to her this year. I sent JR (Moberly) a text and it was kind of his idea. He did it for a past player," MHS head coach Jarrod Haines said. "She got the tip, dribbled it to the bench and handed it off to her sister. It was a good moment for them. "At the end, it was totally all JR. Hats off to him. That was an awesome moment. She hasn’t shot a lot – she only has one leg – so it’s tough. I told her when you come off the floor, you miss 100 percent of the shots you don’t take, and you’ve got two of them. That’s the kind of moments you create that kids will remember forever." 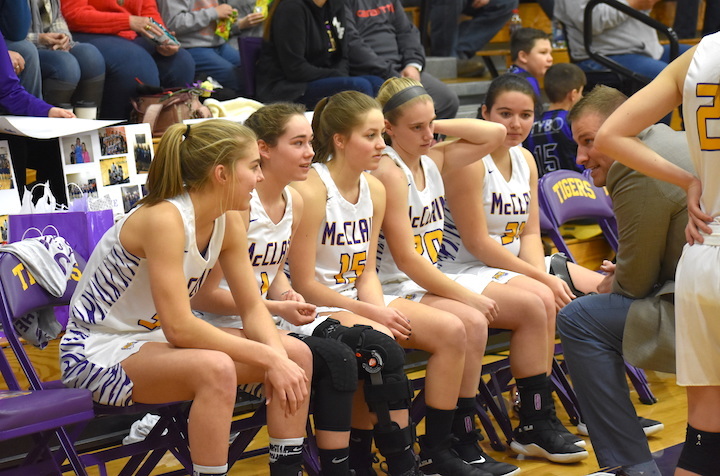 In between the moments about more than basketball was a Frontier Athletic Conference game between two Highland County counterparts, where the opening frame saw the Lady Tigers gain a lead of 18-6. With an all-senior starting lineup, it was senior Kelli Uhrig — who finished with nine points — scoring first, as she put points on the board with a 3-pointer at the 7:07 mark. HHS followed with their first points of the game with a basket by Kelsey Burns, only to see Uhrig answer the basket with points in the paint. Fellow senior Macie Adams swished a jumper for MHS with 3:55 on the first-quarter clock for a 7-2 lead, as she finished the game with five points. The Lady Indians came back with two points by Mackenzie Cosby, only to see the MHS end the frame on a 10-2 run in the final 1:58 with baskets by Karnes, Kyla Burchett and senior Liz Kegley for the 12-point lead. In fact, the final points of the quarter were off a shot at the buzzer by Burchett. Leading McClain in scoring were Karnes with 12 points, who also had a double-double with 15 rebounds, and Burchett with 11 points. Cosby led the Lady Indians with 10 points for the game. McClain (6-3, 13-7) increased their lead heavily in the second frame, outscoring the Lady Indians, 17-7 in the quarter for a 35-13 lead at halftime. The Lady Tigers opened the second with seven straight points, beginning with four made free throws by Kegley (who finished with eight points), followed by a 3-pointer from Jaelyn Pitzer for a 25-6 with 6:01 left in the quarter. The Lady Indians broke the scoring with a basket by Cosby with 5:06 left in the first half, trailing 25-8. McClain came back even stronger with a 3-pointer from Cierra Bolender, followed by more points by Bolender with the junior making a jumper. Bolender finished the game with five points. HHS answered with a bucket by Cosby and a three-point play from Gracie Dean, who totaled seven points in the game. McClain followed with a 3-pointer by Adams and a put-back basket by Uhrig for a 35-13 lead at halftime. The second half was better for the Lady Indians as they outscored McClain 15-10 in the third and 14-10 in the fourth, but McClain’s lead was too much for the Lady Indians to overcome. In the third frame for McClain, Brianna Weller, Burchett and Karnes scored points. The fourth frame for McClain saw points scored by Uhrig, Burchett, Karnes and Kegley. For Hillsboro (0-9, 4-17) in the third, Cosby, Dean, Kayden Watson, Burns, Lana Grover and Karleigh Hopkins (a 3-pointer) all scored points. Watson finished the game with eight points, while Grover and Burns each totaled six for the Lady Indians. "I was really pleased with my kids and the way we came out and played," Moberly said. "We played hard, and I thought we played well. We did a lot of really nice things in the second half. Credit to my kids for fighting in the second half." The fourth frame for the Lady Indians had points from Dean, Watson (a 3-pointer), Grover (a 3-pointer) and Hopkins, who finished the game with five points. For the game, MHS was 14-of-19 from the free-throw line and HHS was 5-of-11. The five seniors honored by McClain were: Maddy Stegbauer, Kelli Uhrig, Liz Kegley, Macie Adams and Bryn Barnes. "It was nice for our five seniors to have their moment together. Like I told them in the locker room before the game, they’ve been at this since they were in the third grade. They’ve sacrificed a lot, stuck with the hard times and good times, worked hard every day, never complain," Haines said. "We just saw that today. They came out, played extremely hard together, had their moment and did really good things. "We did a good job keeping plays alive. I’m super proud of our kids. Our seniors really deserve this. I’m super proud of them." Great picture, Stephen. I think it captures how these girls feel about their coach. ••••Editor's note: GG, I agree. Good to see the players listening to the coach. And kudos to Coaches Moberly and Haines. This is what it's all about. This comment has been hidden due to low approval.